Atomic Power Review is proud to host the Carnival this late August weekend, after a period of not having hosted since June. This long running tradition among pro-nuclear bloggers showcases the best of the pro-nuclear blogs and, should it be the only pro-nuclear blog material you see every week, is a great way to keep up on events. This site first hosted the Carnival all the way back on July 8, 2011 with the 60th edition. From that very first time, I began a tradition here of showing readers a photo at the start and asking them "What is this?" This has continued until now. Some are easy, some are hard; I had to look for a full hour this morning before I found a photo that I thought could be guessed, but was tricky and which I had also never used before. So here you go - What is this? The answer after the Carnival entries. And here they are! Ontario’s nuclear generating fleet has produced record amounts of power over the past few weeks. Using current and historical electric power production data, Steve Aplin of Canadian Energy Issues shows that the nuclear fleet is by far the most efficient producer of power in Ontario. Because it emits no air pollution, nuclear is also the only technology that can further reduce electricity-related air emissions without curtailing vital economic and social activity. Why did gullible reporters promote a student paper about nuclear facility security? There was a flurry of attention in the press last week when a political science professor held a press conference to tell the world that one of his students had written a paper concluding that all of the nuclear power plants in the United States were vulnerable to a terrorist attack. For unpublished reasons, a number of reporters accepted the scare story at face value and published articles stoking fear, uncertainty and doubt. Editors at outlets as varied as Fox News, CNN, Reuters, and National Journal ran fear inducing headlines. "Someone is WRONG on the Internet!" But should nuclear advocates care? Sometimes we have to care. When the outrageous anti-nuclear statements are getting wide play, we have to answer. Sometimes, advocacy is whack-a-mole. What an accelerator really does, in terms everyone can understand, plus details of how these amazing machines serve us in many fields - especially the field of medicine. Last month, TEPCO's president said that all future problems at F. Daiichi would be reported with 'worst-case scenarios.' Transparency means "telling it like it is" in a timely fashion. The "official" creation of worst-case scenarios makes a mockery of transparency. generation IV reactors - by grassroots supporter Jerry Nolan. update and analysis of the situation and implications for the future. A summary of safety features of all molten salt reactors and a review of design choices for molten salt reactors. David LeBlanc of Terrestrial Energy makes a new presentation at the Thorium Energy Alliance Conference 2013. He describes the integral molten salt reactor and how they plan to make a demo reactor within 8 years. A straightforward and quite honest post by Gail Marcus about the continuing impacts of the nuclear shutdown in Japan on the economy and the country's carbon reduction goals. She notes that the average person may perceive that things are functioning almost normally. That is only because fossil-fired plants have taken up the slack--but at a cost. Captain's Choice Posts -- Blog posts I have selected as important posts of this week, which weren't submitted by authors or administrators. Captain's Choice Blog: Everyone should check out NuExec Consulting's blog. This blog posts weekly on Fridays, and is a refreshing change from what we normally see on pro-nuclear blogs because, while it gives lots of insight into the UK nuclear scene, it's also very human and direct. That's it for the entries this week! All that's left is to tell you what you saw earlier - and I am willing to bet a number of you guessed it. The photo is a press release put out by ALCO Products on September 24, 1956, showing its new Criticality Facility. Below (since historians might be interested) is a view of the back of the photo, with glued-on statement. I'll reproduce the text of the statement below the photo. "ATOMIC DEVELOPMENT -- The new nuclear Criticality Facility in the 112-acre Schenectady plant of ALCO Products, Inc. -- builder of the Army Package Power Reactor for the Atomic Energy Commission. This facility will be used to perform experimental reactor studies to check calculations against actual performance. It is one of the first privately owned criticality facilities in the country." It's interesting to note that the bottom of the release states "Formerly American Locomotive Company," as the name change was still relatively new. It's also important to note that this facility was built to support the AEC reactor program which resulted in construction of a number of small reactors for various remote locations, and not in support of an oft-rumored nuclear locomotive program. ALCO Products did not achieve the front-running status in the nuclear energy programs of the US as it might have wished. 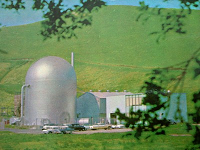 While it had early success with small plants for the Army (not only acting as reactor designer and manufacturer, but also manufacturing the reactor pressure vessels, pressurizer vessels, and steam generators for some projects) it didn't make any break into the larger power reactor market -- although ALCO was in fact offering a 125 MWe commercial nuclear power plant in 1959 which it stated in advertisements was fully designed. None was built. In 1963, ALCO Products shed most of its nuclear business and refocused on its roots of locomotive manufacturing. ALCO briefly made some headway against new, direct competitor (and former partner) General Electric in the diesel-electric locomotive field, with introduction of the new ALCO Century locomotives (so named to mark ALCO's 100th anniversary) and with an attempt to manufacture very large locomotives using hydraulic, instead of electric, transmission. Reliability problems, coupled with dominance of the field by Electro-Motive (a division of General Motors) and unending expenditure of monies by General Electric in the field made ALCO's position shaky. After divesting its nuclear business, ALCO had been bought by Worthington Corporation, which later became Studebaker-Worthington. The owners decided to get out of the locomotive business in 1969, and ALCO's product lines which remained were sold off. The name remains familiar today in nuclear energy circles not just due to the history so briefly detailed above, but also because of the fact that some nuclear plants still employ ALCO design model 251 diesel engines as part of their EDG equipment. The 251 product line has passed through a number of hands since 1969 but presently is under the (very competent) roof of Fairbanks-Morse - itself a former competitor in the diesel locomotive field. 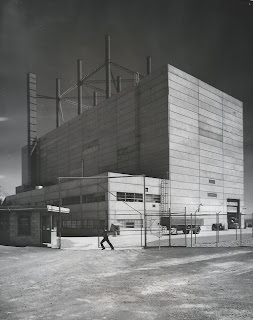 Getting back to nuclear energy.. the Critical Facility's days didn't end when ALCO sold its nuclear business; this facility too was sold, and remains today in modified form as the Walthousen Reactor Critical Facility, operated by Rensselaer Polytechnic Institute. Click here to see their page about the facility, including a link to a long video which shows the facility off to good advantage. I hope you've enjoyed the Carnival this week. Let me know if you guessed the photo before I identified it, using the comments section! Press Release below from Infocast. See link button on right sidebar to access the Infocast site page covering this timely and relevant conference. Join policy-makers, regulators, nuclear industry experts and local stakeholders as they chart a new path forward for nuclear waste storage. Infocast, the leading producer of business intelligence events in various industries, presents the Nuclear Waste Confidence & Storage Management Summit this October 9-11, in Baltimore, Maryland. Nuclear Waste Confidence is clearly in disarray. The Supreme Court decision in June 2012 invalidating the NRC’s 2010 update to the Waste Confidence Rule and the Temporary Storage Rule have forced the NRC to reopen the long-term waste management Environmental Impact Study (EIS). Proposals are emerging to build consent-based long-term storage facilities, centralized interim storage sites and improvements to existing on-site management facilities—plans that will take billions of dollars to implement. Congress may also have to act to enable new waste confidence processes. Clearly, policies, plans and regulatory initiatives remain in a state of flux, and determining when, where and by whom these facilities will be built is an open question for most nuclear industry participants. The Summit will bring policymakers and regulators together with plant operators and local stakeholders to explore the technical, financial and political hurdles that must be surmounted to reestablish Waste Confidence. It will provide an up-to-the-minute view of NRC, EPA and DOE initiatives and studies, and will provide invaluable insights into the paths forward for facilities for high-level waste management, and the potential changes in funding of these facilities. The Summit will also feature speakers from the U.S Nuclear Regulatory Commission, U.S. Nuclear Infrastructure Council, Yucca Mountain Project, Georgia Public Service Commission, Minnesota Public Utilities Commission, Citizens for Nuclear Technology Awareness, Union of Concerned Scientists and more! For more information, to inquire about sponsorship opportunities or to register, visit infocastinc.com/nuclearwaste13 or call 818-888-4444. I never thought this would happen, but believe it or not, the Bellona Foundation has actually published something that could be considered positive when it comes to nuclear energy. On August 9, I published a piece about the USS Miami, and decided to include a large number of links that show and explain the process the US Navy / DOE uses to dispose of the nuclear subs and ships, and their reactor plants, at the end of the vessels' lives. This morning, while looking for a little bit more information on the Miami, I happened to stumble over a link to a piece on the Bellona site which describes the Russian Navy Northern Fleet's parallel program. Now, to be completely honest, Bellona has been wholly negative about the Northern Fleet's entire operation (not just submarine retirement) for many years, and a long time back began publishing a series of articles on the rather dire nature of the retired but still-not-scrapped, rusting nuclear powered submarines of that fleet. What we see now is a surprising turnaround from 1995 when Bellona published its original huge and now-deleted report on the Russian Northern Fleet. Today, cleaned up, painted and sealed reactor compartments are being stored on land in a way that's a lot like what the US Navy / DOE is doing. Click here to see the Bellona article "Cold War Nuclear Legacy Dismantlement in Sayda Bay: Mission Possible." Especially interesting are the large, high quality photos that are available on the page (click to enlarge,) and the photo of the Alfa class sub reactor compartment is particularly notable. More views of the Sayda Bay facility and decommissioned submarine reactor compartments both floating and on land can be found at this Facebook page album. Keep in mind that the objects in the water that look like submarines or parts thereof are actually decommissioned sub reactor compartments with one compartment retained fore and aft to act as floats. Some appear to have been the original adjacent compartments as originally built, but at least one boat appears to have a bow and stern section (very tapered) welded on in front of and behind the reactor compartment instead. I've seen at least one photo of a floating partial boat like this which had additional floatation added externally. It is now fact that with the help and investment of Germany, the Russian Navy is really getting up to speed rapidly on this long-delayed program, which no doubt will ease the minds of many neighbors who have been given little but misinformation over the years. My hat is off to Bellona for publishing this piece. Well done; I like to see success stories. News came out yesterday that the long-delayed, much debated Indian missile sub INS Arihant hit a major milestone as its reactor was made critical for the first time. This does not signify an immediate submarine ballistic missile deterrent capability for India, as both the submarine and the missiles have yet to be proven out, but it's a major step. Now, to be honest, I knew about the Indian nuclear sub program vaguely but had no real details. When I saw the following post yesterday, I was quite surprised at the photograph contained therein. Click the link below to see what I saw. The illustration is of the prototype plant which was built some years back to prove out the nuclear power plant for the submarine. Navy old-timers of a certain vintage will find the photo very familiar looking -- but more of that later. The photo in that article can be enlarged; click here to see it full size. The Indian submarine program has developed under a solid cloak of secrecy, even using deceptive names for some of its programs. I've scanned through a number of online sources, and here are the details I've been able to gather. • Work on the Indian nuclear sub program dates from the 1970's, and has long been referred to as part of the Advanced Vessel Project or AVP. • The prototype nuclear plant is located at Kalpakkam. It was developed under the program "Plutonium Recycling Project" or PRP, under direction of BARC or Bhabra Atomic Research Center. • The prototype plant first achieved criticality November 11, 2003 and after a period of what we must assume was testing and modification was declared operational September 22, 2006. • The prototype plant was only shown to the press once, in early August 2009, about one week after the well publicized launching of the Arihant itself. Apparently only one photo was cleared for distribution. A report on the press tour can be found here. • Most sources list the prototype and the Arihant reactors as being rated 82.5 MWt. • This link gives some details of the program's subcontractors, in order to make clear that this plant is a completely indigenous development. It names the manufacturers of the reactor vessel and steam generators, for example. For further reading, here is another news announcement from August 10th. 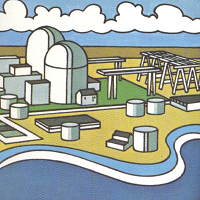 This covers first criticality of the Arihant's reactor (dockside testing of the steam plant supplied by a shoreside steam supply having already been completed) and gives an overview of the real stretch of time ahead before the sub can be considered fully operational as a military asset. It has been made clear that India is building more submarine power plants for follow-on units of this class, and that it has more than enough capability to produce highly enriched reactor fuel for these plants independently. It expects to be able to produce lower-enrichment reactor fuel for large commercial nuclear stations in the future. This is the front cover of a booklet entitled "They Harnessed the ATOM," published by Westinghouse Electric Corporation in September 1954. * This advertising / commemorative piece gave (completely unclassified) details of the construction of the prototype for the Nautilus, the launching of the Nautilus itself, and details on the projected Shippingport Atomic Power Station, then years away. Resemblance of the illustration above to those linked further above showing the Indian prototype plant at Kalpakkam is all too obvious. The one just above shows the STR Mark I, better known as the S1W plant; this was the prototype for the USS Nautilus, and was built at the National Reactor Testing Station, Idaho. 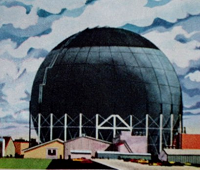 According to the booklet, Westinghouse Atomic Power Division "took on this pioneering assignment in December 1948." The reactor was first taken critical on March 30, 1953 and the first steam power was actually developed by the powerplant on May 31. Full power was achieved on June 25... meaning that the whole project took just four and a half years from contract to full rated power. Below is another view from page 7 of this book, showing the plant from above. Clearly visible in both the photos of the Arihant prototype and in the Mark I are large cylindrical tanks around the plants; the booklet describes the tank above as containing 385,000 gallons of water. Below is a press photo from Westinghouse which was released in January 1954, right ahead of the launching of the USS Nautilus. Caption (on back) -- "WINDOWLESS BUILDING ON IDAHO DESERT HOUSES FIRST ATOMIC SUB POWER PLANT ... National Reactor Testing Station, Idaho -- Inside the large, windowless part of this eight-story building, engineers and scientists of the Westinghouse Electric Corporation are testing the land-based prototype model of the world's first practical atomic engine which will power the USS Nautilus. Located at the Atomic Energy Commission's National Reactor Testing Station on a southeastern Idaho desert, the specially designed structure is made of concrete slabs bolted to steel framing. A unique ventilation system keeps the interior of the building slightly pressurized so that dust from outside will not seep into it. The six steel stacks on the top of the building provide exhaust outlets for emergency purposes. At the base of each stack is a big fan capable of discharging some 36,000 cubic feet of air per minute. The large square stack at the left is for normal ventilation. On May 31, 1953, full-scale testing of the submarine power plant was begun. This land-based model, designated as "Mark I" was designed and built by Westinghouse in cooperation with the Argonne National Laboratory at the Atomic Energy Commission's Bettis Plant. The atomic engine which will power the Nautilus, called Mark II, also was built by Westinghouse at the Bettis plant." India has clearly done two things: First, it has achieved roughly the first several important steps in establishing a nuclear powered naval submarine force, at least so far as the power plant is concerned; it has operated a prototype submarine plant, which outwardly is clearly designed along established (and publicly available) lines generally, for some years now and has taken the seagoing version of this plant critical for the first time. Second, though, it has taken very many years to accomplish these tasks, with first criticality of the prototype plant occurring some ten years ago, operational status three years later, and only just now criticality of the first seagoing plant. (Nautilus was launched January 1954 and its reactor first went critical in December 1954, under two years after the prototype went critical.) It remains to be seen if the plant will peform well in a moving, rolling platform and if it will be reliable at sea. Trials are not expected for the Arihant until at least 2015. It has been reported that the PWR (pressurized water reactor) type plant used in the Kalpakkam prototype and the Arihant is expected to lead to a completely indigenous 900 MWe commercial nuclear plant, which itself is only in the design stages and is yet many years off. What's important is that India is very determined, has apparently faced and beaten many problems with its program, and forges into the future with a clear purpose and initiative to both develop a strategic deterrent and, at the same time, a stand-alone industry building pressurized water reactor plants. * "They Harnessed the ATOM" Westinghouse Electric Corporation - Information Services Department. 3 Gateway Center, Pittsburgh, PA. Pub. No. MB-1862. Print code 20M---9-54. The print code can be deciphered as 20,000 copies, published September 1954. INL page on Naval Reactors Facility and prototypes including S1W. "Nuclear Navy Celebrates End of Era in Idaho." Another Navy reactor prototype site has been covered on my website before - the Kesselring Site in upstate New York. Last year, it had an important announcement. "We'll wait to see whether the Navy decides to rebuild and return the Miami to service, or decommission her and send her to NPSSRP (Nuclear Powered Ship and Submarine Recycling Program) early." This week, the Navy decided that damage to the ship's systems and structure was too severe to warrant repair (which would by reports have entailed essentially building an entire front third of the submarine brand new) and announced that USS Miami would be decommissioned and defueled at Portsmouth, then sent to the Puget Sound shipyard on the opposite coast for recycling. This process involves the removal of the reactor compartment from the other portions of the submarine. 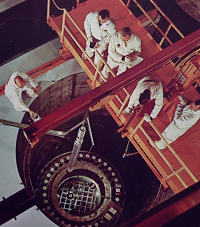 The reactor plant remains inside the reactor compartment, which is sealed, but the nuclear fuel is already long gone at this point. The reactor compartment is then shipped to Hanford, where it is placed in a large burial area which contains the reactor compartments of all decommissioned and scrapped nuclear powered ships including all submarines and cruisers. The rest of the ship other than the reactor compartment is scrapped and the material recycled. The Navy has been recycling nuclear powered vessels for many years. Click the link below to see the official history of Puget Sound Naval Shipyard, in which you'll find the reference to the launch of the Navy's NPSSRP program. Below is a link to an interesting, if brief, page on the Brookings Institute site that describes the Navy's nuclear powered ship recycling and provides a number of interesting photographs. The following two site links show a selection of photos from Puget Sound from years long past. ...but the "Grandfather" of all NPSSRP pages is that of Don Shelton, found linked below. I have a paper copy (four large books) of the Final Environmental Impact Statement (FEIS) on the Disposal of Decommissioned, Defueled Naval Submarine Reactor Plants in my library. Some interesting observations about the history of the recycling program can be gleaned from this document. • In May 1984 when the document was issued, the Navy had still not decided to dispose permanently of any nuclear powered submarines or ships at all. According to this FEIS, at the date of issuance, only seven nuclear submarines (and no nuclear surface ships) had been decommissioned; six of them were in "protective storage at Naval shipyards." These six were USS Triton (decommissioned 1967), USS Halibut (decom 1976), USS Abraham Lincoln and USS Theodore Roosevelt (both decom 1981), and USS Ethan Allen and USS Thomas A. Edison (both decom 1983.) USS Nautilus was decommissioned in 1980 but had special status as a historic ship, and was eventually preserved as a museum and memorial. • The FEIS states that the Navy expected further submarines to be placed in protective storage in the year 1984; it states that submarines could be stored this way for about 20 years, at which time they would have to be drydocked for maintenance. After this it expected three to five decommissionings of nuclear subs each year, and a total of perhaps 100 nuclear submarines to be decommissioned between 1984 and the end of the century. • The Navy had long realized that there would be an eventual need for a program to deal with disposal of nuclear powered ships; the Draft Environmental Impact Statement was issued in December 1982. Over 1500 copies were distributed for comment and review. • The FEIS examined three methods of disposal for nuclear submarines. First was to cut out the reactor compartment, seal it, and then ship it to either Hanford or the Savannah River Site for burial. Next was to cut out the reactor compartment, seal it, and sink it in the ocean at a designated and approved area. Finally, an examination of continued preservation of the entire submarine was made as a comparison. The first option, with Hanford selected as the burial site, won out, as we now know with the actual recycling program starting in 1990. 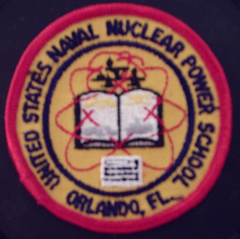 The USS Miami will, it is reported, be deactivated (reactor fuel removed) at its present location, Portsmouth, and will then likely be towed through the Panama Canal to Puget Sound for the recycling program. All of Atomic Power Review's readers are aware that after the declaration that the reactors at Fukushima Daiichi had "reached cold shutdown," which really is a benchmark in the recovery road map and not deliberately an accurate application of the term itself as normally used in nuclear power, this site for most purposes halted having daily or even weekly updates on the situation. We find ourselves, now, at a period wherein this author believes that some sort of breaking point may be in the near future -- a point at which outside intervention of some sort, either in a small way such as active, ongoing, daily onsite assistance from other utilities / nuclear operating companies / trade organizations / international regulators may be required, or else on the other end a complete takeover by such entities of the site operations from TEPCO. Let me be clear - there is no approaching nuclear crisis of any sort. This chain of events has to do with two things, and two things only: Contaminated water, and TEPCO's management. Readers are sure to know from many sources that contaminated water, at higher levels of activity now than prior, has been found in various locations on site, including in sampling wells, cable / pipe trenches, turbine buildings and even in the inner harbor. I would recommend that readers click on the link following if they're not up to speed on these developments; the link is an article I wrote for the American Nuclear Society's blog. There have been a number of other developments since I wrote the ANS article almost two weeks ago. Other news coming from the area reflects the increasing frustration of the nuclear regulator, the NRA, and the local population and officials. The important fact to note about the flow of the events in the three links above is that Fukushima prefecture inspected the site, and later that day asked the Japanese government to either take a stronger hand or else take over completely at the site. At an early time, months after the accident, it became clear that buildup of contaminated water on the site would become a major issue. In June 2011 NISA (now NRA) ordered frequent reporting on the status of water storage, contamination and cleanup on the site. Here is the latest report of the series. This is all quite an elaborate and complicated scenario, so I'd like to make a few simple observations. •The Fukushima Daiichi plant site actually sank several feet after the earthquake. What this has done is effectively raise the level of normal ground water relative to the level of the nuclear plants. Remember - the plant site dropped, but the water level of the ocean didn't. •Water being pumped into the three reactors to keep them cool and safe is leaking out of the reactor plants, into the reactor buildings and then into the turbine buildings. TEPCO would like to keep the level of this water low in these buildings, because if it's high it tends to leak out and contaminate the ground water. (This requires pumping out and decontaminating the water.) On the other hand, if the water level is too low, then ground water seems to leak IN to the buildings. This increases the total volume of contaminated water on the site. There is thus a balance -- and remember, the ground water level changes with tide and with rainfall. •Barriers to outflow of contaminated ground water into the harbor and ocean seem to also be holding water inside the barriers at unanticipated high levels, making the level of groundwater (unnaturally) higher than it would normally be. •TEPCO did announce in the last several months that it thought that it might have to discharge a fairly large volume of low-level contaminated water deliberately to the sea in order to free up room in storage on the site for much worse water. That move was denied in all quarters. It would seem now as if that move would have been the better choice, given the outcome of the last two weeks. TEPCO's decision to "sit" on the news about contaminated water releases has received a violent backlash in all quarters. Reaction by news media, local citizens and the NRA has been very stiff - to put it mildly. This has further damaged the company's reputation, leading some to wonder if it is capable of finishing the job of decommissioning the site. This has led to the prefecture's request to the Japanese government that intervention occur -- and at this point, that seems to this writer as if it would be a necessary and probably welcome step. I'll be keeping a close eye on these developments and report findings here; also watch my twitter account @atomicnews for further updates. Breaking update: Just as I was about to publish this article at 2:25 PM, Reuters carried a breaking news alert saying that the Japanese government will in fact commit funds to the containment of contaminated water at Fukushima Daiichi. Watch Twitter @atomicnews for more. My prediction from earlier today didn't take very long to come true. Chief Cabinet Secretary says Prime Minister will order increased government involvement, expenditure of funds later today. A slightly earlier report with less detail can be found here, for the record. I would expect press releases at the least regarding this development from the Japanese Government and probably from NRA, and perhaps (but not guaranteed) from TEPCO. If and when those appear I will link or reproduce them on this post. News of Prime Minster Abe's announcement has come out widely. The website of the Office of the Prime Minister has yet to update with any statements about the situation. The Chief Cabinet Secretary's August 7 AM Press Conference video is posted on the government website, with the discussion of the Fukushima situation beginning at 02:30 in the video. The conference was before Prime Minister Abe made his statements and orders to assist, but is worth watching. Discussion of the topic runs through about 06:00. Plans are afoot to actually freeze soil in a massive area around the nuclear plant. As the Chief Cabinet Secretary said, "such plans are unprecedented." This would be the largest attempted project of its type anywhere in the world. I myself don't imagine that this plan will be the sole, final solution to the problem. While the concept is intended to fix the problem in one blow, as it were, the execution at first take seems an engineering nightmare. It would be extremely desirable for Japan to immediately request assistance from major architect-engineer firms, in my opinion, for input on how to deal with the site. That aside, they're definitely moving in the right direction and must be commended for their having taken action. We now have a bit better handle on the basic water flow path from off site to on site and into the ocean at Fukushima Daiichi. These figures are quite rough and probably change significantly at periods of heavy rainfall. • 400 tons of this gets into the reactor buildings and turbine buildings, and mixes with contaminated water already there. TEPCO is pumping water out of these buildings, cleaning it up, and then injecting some of this into the reactors to keep them cool and storing the rest. The NHK report that revealed this water flow balance is found here. More details as they're made available. I'm specifically waiting for information to show up at the MEXT or the Prime Minister's sites. The Governor of Utah, Gary Herbert, has publicly placed his support behind the Western Initiative for Nuclear, an effort to get a Small Modular Reactor (SMR) built at the INL facility in Idaho as a prototype for what is hoped to be a major build out of this kind of nuclear plant. Click here to see Salt Lake Tribune article on Herbert's statement. I've written a good deal on the Western Initiative for Nuclear at the ANS Nuclear Cafe site, so I'll not duplicate that effort here but rather refer readers to that article - click here to see it. I first heard Sherrell Greene speak at an ANS meeting -- I believe it was at the 2012 Winter Meeting in San Diego. I recall having been really impressed by his immense knowledge, insight, clarity and above all his ability to relate issues directly to the entire audience. I made some serious notes during his talk, and perhaps more than most speakers, Mr. Greene really left me feeling as if I'd gotten one hundred percent of what it was he had appeared at the meeting in order to convey. The latest post on his blog, which blog is entitled "Sustainable Energy Today," is a very closely related example to the talk he gave in terms of its accessibility. The post is entitled "Nuclear Power - Staring the Dragon in the Mouth," and it really is an honest, deliberate, hard look at the biggest problems we face in building out more nuclear plants. It's also written so that the concepts are completely accessible to general folks who have no clue what an FEIS or an RAI is. Not always, I've noted, does Mr. Greene pretend to have all of the answers -- or, if he in fact does, he might be employing the Socratic method to get us to where he already is. No matter which, his writing (and speaking) style get right to you, honestly, where you are -- a style I in fact admire. I'd very much recommend my regular readers flip over using the following link and check out Sherrell's post - it will be time well spent. Sustainable Energy Today: "Nuclear Energy - Staring the Dragon in the Mouth." I take a vacation, and what happens? I took a brief vacation to spend time with the family. Of course, the news during that time was rather busy, and not great. There was, however, a bit of good news. It even looks as if some of the good news might extend overseas. Now, the first news item is the only one that seems right now to have any sort of immediate impact for the nuclear industry / nuclear renaissance, if we might give that latter an identity. What Duke did was avoid, almost but not quite at the last minute, the need to actually begin turning over any dirt, or buying any very expensive, long lead-time equipment for the Levy County nuclear plant on its own dime. Since the EPC (Engineering, Procurement, Construction) agreement with Westinghouse originally stipulated (as Duke said in its release) that the plant would be licensed by January 2014, and since the most recent NRC review schedule doesn't even complete the final SER (Safety Evaluation Report) until September of 2014, Duke felt that the schedule had slipped too far... especially considering the hold on licensing while Waste Confidence is held up. Of course, continued low natural gas pricing and growth in electricity demand below that originally predicted don't help the Levy nuclear plant project, either. What may have been the deciding factor was the recent change in cost recovery in Florida, that allows the utility to only recover costs associated with licensing before the plant is completed. This means that Duke would have had to (sooner or later) begin purchasing equipment and begin preparing the site without the chance to recover costs from the ratepayers until the plants were finished. Duke will continue to pursue the COL (Combined License, allowing construction and operation) but will not actually construct or buy anything; it only will continue to get the already-certified AP1000 design licensed for a two-unit application at the Levy County site. This allows Duke to at least stay in line, as it were, in the regulatory process (which lately seems to be a problem holding everyone up and more and more often is mentioned in business decisions) and not have to start all over again, especially important since it does believe that nuclear energy has a role to play in the future energy mix. Other news -- Other blogs! Here is a blog I would highly recommend. The very talented ladies behind this blog provide a weekly update with keen insight into the nuclear energy situation in the UK -- which is exceedingly difficult to get a handle on and keep up with using only US-based press. What they also really add is a human factor that I find refreshing. The blog posts on Fridays, and is a great way to cap your week. I must thank Meredith Angwin over at Yes Vermont Yankee for having pointed out this new blog, written by an admitted progressive, Eric Schmitz, who is also an engineer and what we might call an ever-more-well-informed nuclear enthusiast. His mission is to get 'his side of the aisle' on board with nuclear energy; let's wish him well in his efforts! There's also a new post at The Breakthrough Institute's site, which has been forwarded to me by Jessica Lovering, that features a number of quite prominent progressive / liberal folks who would like just a moment of your time to make their case for nuclear energy. Click here to read this post -- which you might find to be a great follow-up to the "Progressives for Nuclear Progress" blog. People on my side of the aisle should at the very least appreciate the efforts being taken now to get the other side up to speed on nuclear energy's benefits, the real, actual risks, and the incredible safety record of all the many not-normally-newsworthy nuclear plants around the world that run day and night; the previous two links are just a bit of the evidence of this phenomenon. Finally for now, the Nuclear Energy Institute has completely redesigned its website, and I intend to spend some time this weekend looking around all of the links and finding the new features. Click here to see it!